In this article, I will discuss about Licensing your SharePoint app on office store. When you upload your app on the Office Store for publication, you can choose the terms of the license you want to offer, like offering your app for free, trial, or for purchase. Or your app can be acquired on a per-user or site basis. SharePoint provides a licensing framework that lets you include code logic in your app to enforce whatever licensing restrictions you choose. For example, you can include code logic in your app that enables users to access certain app features if they have a paid license, but not if they have a trial license. A user with a license for an app can use that app on any site for that particular SharePoint deployment. In general, for the purpose of app licenses, deployment is defined as the SharePoint farm for on-premises SharePoint installations, and the tenancy for SharePoint Online in Office 365. The app’s purchaser can manage the app license, assign those app licenses to other users within their deployment, and enable other users to manage the licenses. A user who is assigned an app license can access and use the app. For apps for SharePoint that have a per-user license, each app license can be assigned to the specified number of SharePoint users. The app license applies only to the specified SharePoint deployment and the specified users. For apps with a site license, that license is assigned to all users on that deployment automatically. You cannot programmatically assign app licenses. 1. The user launches the app from within SharePoint. 2. This launches the app code in the cloud. 3. 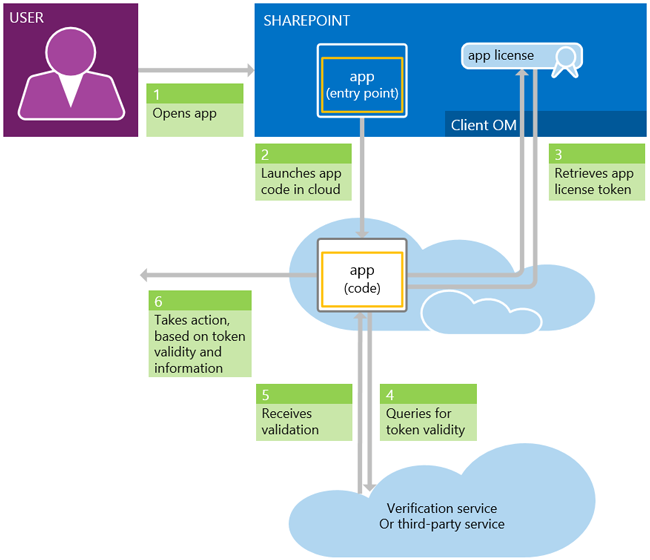 When the app needs to verify a user’s app license, it uses server-side code to query SharePoint, via the client object model, for the app license token. 4. It then passes that token to the Office Store verification service. 5. The verification service returns whether the license token is valid, and if it is, also returns the license properties. Finally, after you finish testing your app and are ready to move it to production, you need to add code to the license checks in your app so that the app no longer accepts test licenses. For test app licenses, the IsTest property returns true and the IsValid property returns false. This sample requires a reference to Microsoft.SharePoint.Client.Utilities, and a web service reference to the Office Store verification service. //Get the license token XML from SharePoint. //Call the Office Store verification service. //Get the license from SharePoint. //Just get the first license token for now. Hope you have enjoyed this series !! Analben Mehta is a full-stack software engineer & architect with passion for technology, computer science and everything in between. She aspires to improve peoples’ lives through technology.